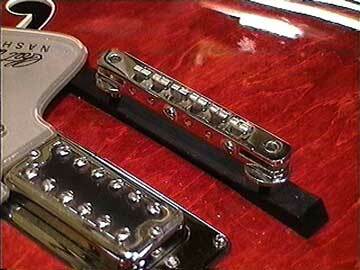 Here's a little trick I learned from Bill Richardson, Gryphon's electric guitar guru. 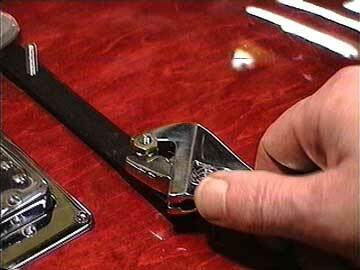 I can't say exactly why, but somebody drilled two holes in the top of this nice red Gretsch guitar. Then he screwed the bridge adjusting posts directly into the top, and secured them with glue. I suppose it was an effort to keep the bridge from moving around, but he missed the proper location by about 3/16"
The challenge is to extract the threaded posts from the bridge and the top of the guitar without damaging the threads or the plating on them. I take a couple of wrenches and tighten the nuts together very tightly. 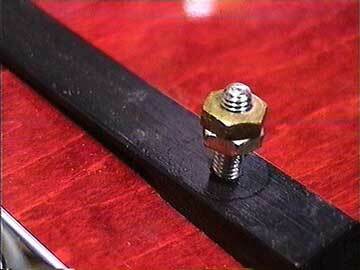 The post unscrews neatly and I can disengage the two nuts without a trace of damage to the threads.